LANSING — Michigan’s 2016 elections saw millions of dollars in political spending from groups whose donors remain hidden from public view. The Michigan Campaign Finance Network analyzed TV ad-tracking data and reviewed thousands of pages of disclosures on ad purchases to determine at least $6 million was spent on political TV ads in 2016 by groups whose donors didn’t have to be disclosed. Last year, dark money in Michigan funded a statewide ad campaign that told viewers to “vote for life” on Election Day. It paid for an estimated $1.7 million in broadcast TV ads that benefited two members of the state’s high court. And it helped make the 2016 fight for control of the Michigan House of Representatives the most expensive in history. It’s all permissible in Michigan because of lax transparency laws that specifically allow groups to spend secret money in campaigns as long as their ads and mailers don’t expressly tell people which candidate to vote for or against. Below are 8 examples of how dark money surfaced in Michigan’s 2016 elections. Right to Life of Michigan launched a statewide TV ad campaign in the weeks before the November election. The anti-abortion nonprofit organization ran broadcast TV ads that didn’t mention any candidate by name but told Michigan viewers to “vote for life.” The next president, the ads said, “will likely” appoint replacements for three to four of the nine U.S. Supreme Court justices. Because of the way the ads were worded, no disclosures on how many ads were bought must be made. Right to Life of Michigan spokesman Chris Gast said the organization spent about $350,000 on running the ads. Gast said the organization tries to run ads every fall on TV. As usual in Michigan, the state’s two major political parties were responsible for a large portion of the untraceable spending on TV ads in the 2016 election. Based on estimates by Kantar Media/CMAG and hundreds of filings with the FCC by TV stations, MCFN tracked at least $2.3 million in so-called issue ads from the Michigan Republican Party and the Michigan Democratic Party in the fall of 2016. These ads didn’t tell voters explicitly how to vote but provided information either praising or slamming specific candidates that implied how viewers should vote. Of the total, about $1.2 million was from the Michigan Democratic Party, and about $1.1 million from the Michigan Republican Party, according to MCFN’s tracking. The Michigan Democratic Party ads focused on Michigan House races. The Michigan Republican Party ran the majority of its ads in state House races but also ran an estimated $121,000 in broadcast ads in the two Michigan Supreme Court races, according to Kantar Media/CMAG tracking. Voters in competitive House districts across Michigan reported receiving dozens upon dozens of mailers in the fall of 2016 — many of which came from the state’s two major political parties and fall outside campaign finance disclosure requirements. MCFN obtained the mail of voters in two competitive House races: the 106th District in Northern Michigan; and the 71st District in central Michigan. The voter in the 106th District received 24 total mail pieces related to the House race. Eighteen of those mailers came from sources that didn’t disclose their donors. Twelve of the mail pieces were from either the Michigan Republican Party or the Michigan Democratic Party. Another three mail pieces came from the nonprofit organization Campaign For Liberty, which touted Republican candidate Sue Allor, of Wolverine, in one mailer and bashed her Democratic opponent Robert Kennedy, of Haynes Twp., in two others. Americans for Prosperity sent out a pro-Allor mailer. 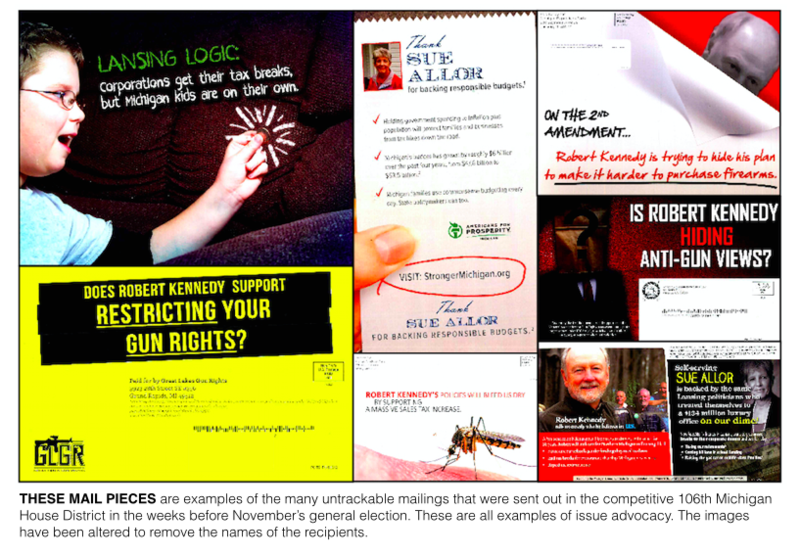 Great Lakes Gun Rights and the National Association for Gun Rights sent out mailers bashing Kennedy. 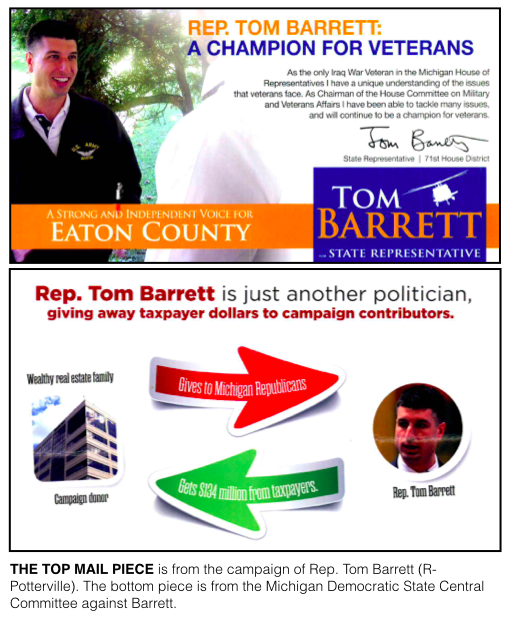 In the 71st District race between Rep. Tom Barrett, a Republican from Potterville, and former Rep. Theresa Abed, a Democrat from Grand Ledge, MCFN tracked 43 different mailers. Of those 43, 16 fell under campaign finance disclosure requirements while 27 didn’t. Twenty-five of the 27 came from either the Michigan Republican Party or the Michigan Democratic Party. 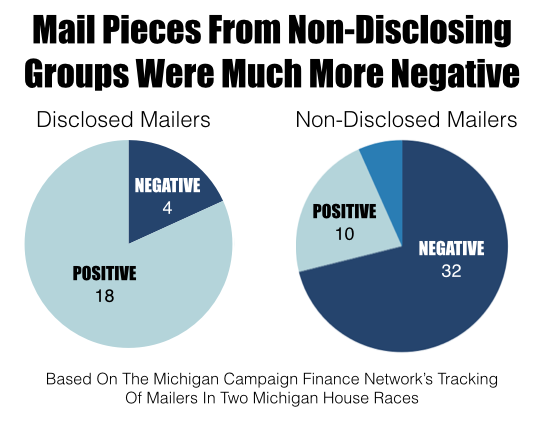 In both races, the dark money mailers tended to be much more negative than the mailers funded by disclosed donors. Of the 45 non-disclosing mailers tracked, 32 — or 71 percent — attacked a candidate, 10 supported a candidate, and three supported one candidate and bashed another. Of the 22 mail pieces that fell under campaign finance disclosure requirements, according to their disclaimers, only four pieces attacked a candidate, and 18 supported a candidate. The four negative pieces came from a Super PAC. In addition to the general election mailers, MCFN also tracked in 2016 a mail campaign against conservative candidates in Republican primaries, mysterious mailers touting Libertarian candidates and mailers from undisclosed sources in a handful of Democratic primary races. A nonprofit organization that doesn’t disclose its donors and that’s connected to Gov. Rick Snyder ran TV ads this fall promoting six Republican House candidates. MCFN tracked at least $118,000 in spending on the ads. The ads stated that Michigan’s “comeback will stay alive with leaders like” the six GOP House candidates. The nonprofit ran additional ads that solely focused on Snyder’s record as governor. Launched in 2015, the nonprofit was started to support Snyder as he considered a potential campaign for president. Its donors have never been released. It announced it was getting involving in three congressional races in Michigan on Oct. 14, less than a month before the election, and it reported spending $2.2 million on races in Michigan. Most of the spending was on media placement and production. The group reported spending about $1.4 million against Democrat Suzanna Shkreli in Michigan’s 8th Congressional District. Rep. Mike Bishop, Republican from Rochester, defeated Shkreli. American Action Network reported spending about $309,000 against Democrat Gretchen Driskell in Michigan’s 7th Congressional District. Rep. Tim Walberg, a Republican from Tipton, defeated Driskell. And it reported spending about $540,000 against Democrat Lon Johnson in Michigan’s 1st Congressional District. Rep. Jack Bergman, a Republican from Watersmeet, defeated Johnson. The Michigan Chamber of Commerce spent an estimated $1.5 million on broadcast TV ads this fall touting the two Republican-nominated Supreme Court candidates, based on ad-tracking data from Kantar Media/CMAG. The Chamber maintains multiple political action committees, which disclose their donors. But the ads didn’t come from the Chamber’s connected PACs, according to the ads' disclaimers, and the donors behind the ads don’t have to be disclosed because of the way the ads were worded. The ads described Joan Larsen and David Viviano as being “tough on crime” and said they “stick to the law” and “follow the Constitution.” Both Larsen and Viviano won their races for the Supreme Court. There’s no way for the public to know whether some or all of the money for the ads came from parties with cases before the court. Like many previous elections, voters across Michigan reported receiving robocalls in the fall of 2016 from untraceable organizations. As long as the calls didn’t expressly advocate for someone’s election or defeat, the donors behind the targeted calls didn’t have to be disclosed. MCFN uncovered in 2016 how two stealth committees were parroting Michigan Republican Party talking points in a series of competitive state House races. — And a call from the 23rd District in Southeast Michigan. From all indications, a nonprofit called Detroit Jobs First spent heavily against a city ballot proposal in Detroit that would have set requirements for community benefits agreements. The agreements would have provided hiring and negotiation standards for developers that want to work on large projects in the city. Detroit Jobs First ran ads labeling the proposal “awful” but because the ads didn’t tell people to vote for or against the proposal, the organization was able to avoid campaign finance reporting requirements. So there’s no way to tell where Detroit Jobs First’s money came from or even how much it spent. TV stations have to file documents on political spending with the federal government if the purchased ads mention candidates or issues of national importance. By focusing on a city-specific ballot proposal, Detroit Jobs First did neither, according to filings from Detroit’s broadcast TV stations. The ballot proposal, Proposal A in Detroit, failed with only 46 percent voting in support.